As I’ve mentioned a fair few times, I look at birds on wires a lot so paintings like this result. This painting continues around the sides, so in theory can be hung without a frame. The sides are 3/4 of an inch thick and painted almost black. Stone Walls, No Sheep is now SOLD. 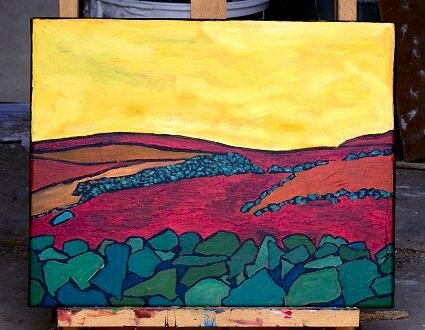 Stone Walls, No Sheep is part of the End of Year 2009 online sale of paintings, which has launched with paintings at half-price and FREE shipping worldwide until Christmas Eve. Dozens of new paintings are being rolled out on my personal blog Bicyclistic in batches of 5, 6 and 2, 3. To see announcements first follow me on twitter.